If AAU basketball is about playing games to impress college recruiters, the high school season brings an emphasis on fundamentals and team play. Sara Scalia and Anna Harvey kibbitzed at center court Saturday after Scalia and her Stillwater teammates scored a convincing victory over Harvey’s Lakeville South team in the Breakdown Tip-Off Classic. The meeting was jovial — two friends who’d spent the spring and summer competing together for the North Tartan AAU program, now opponents for the coming months. Their interaction lasted no more than a minute, but it spoke volumes about the nature of basketball’s high school and AAU seasons. On one hand, they are foes proudly representing rival schools, and leaders of their respective teams. On the other, they are still teammates and friends with the common goal of developing themselves as players while hoping to impress college recruiters. It’s led to a duality to basketball that both coaches and players — boys and girls — admit can be difficult to manage. When the high school season concludes, Edina girls’ coach Matt Nilsen coaches for the Minnesota Stars AAU program. With a foot in both camps, Nilsen is well-positioned to address the good and not-so-good aspects of basketball in its two-stage format. One of the biggest problems Nilsen sees is AAU’s emphasis on games rather than practices, which can allow fundamental skills to slide. Weekends during the spring and summer are heavy on AAU tournaments. Time to practice — and work on little things that can make the difference between winning and losing — is often nonexistent. By contrast, most agree that the daily nature of the high school season lends itself to a greater degree of teaching. 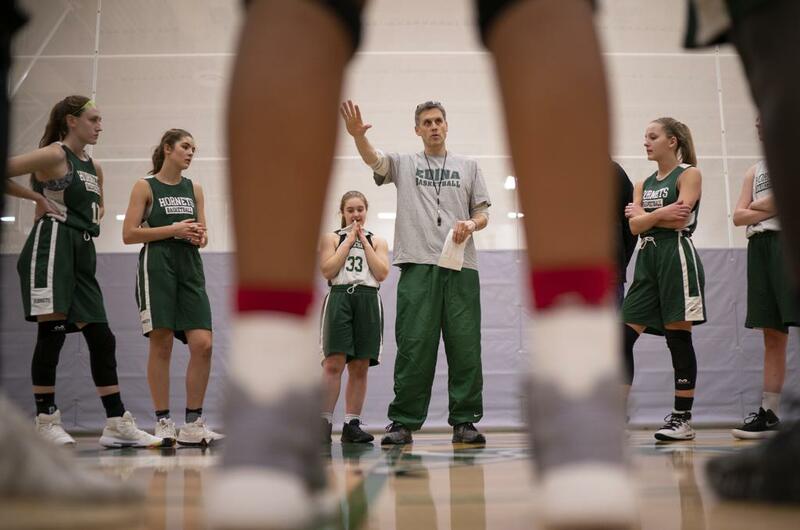 At a recent Edina practice, Nilsen’s charges spent the first half-hour in the classroom, watching video, learning scouting reports and developing their basketball IQ. On-court drills followed. Practice ended with conditioning and strength training. Such an in-depth schedule is not possible in AAU, where players often live hours apart. Forest Lake guard Lexie Hultman, who plays for the Minnesota Stars, said the high school season can be more physically taxing. It’s not just a matter of the differing physical tolls each season expends. Coming to understand the on-court dos and don’ts, such as widely varying styles of refereeing, takes time. It’s generally accepted that the high school game is officiated much tighter than at the AAU level, where tournament schedules are tight and foul trouble doesn’t jibe with the primary reason the league exists: to showcase talent. Players are forced to play a less aggressive style, an adjustment that can take time. “I like that kids are playing ball in the offseason, but it can be too much,” St. Michael-Albertville girls’ coach Kent Hamre said. Cretin-Derham Hall assistant boys’ coach Tony Yazbeck has been involved with the Howard Pulley AAU program since 1994 and was appointed to the board of directors in 2014. Among the players he’s seen come through the program are Tyus and Tre Jones, Joe Mauer, Khalid El-Amin and current Gophers Amir Coffey, Gabe Kalscheur, Jarvis Omersa and Daniel Oturu. He’s tolerated plenty of snide comments and assumptions about AAU and responds by saying many of them are just not true. Yazbeck also rejects the long-held stereotype that AAU coaches are little more than glorified baby sitters who acquiesce to players’ moods and demand little of them. For the players, the priority scales are tipping toward AAU, largely due to a higher level of play and opportunities that it affords. They enjoy both seasons, but the summer game, often with a more talented and dedicated group of players and the chance to get noticed by college coaches, gets the nod. “I like AAU because it’s faster, more up-tempo and has more flow,” said Hofschild, who will play at Seton Hall in New Jersey next year. Harvey enjoys both levels, but she said the benefits and enjoyment of AAU are difficult to overlook.